This collection of stripped-back custom seating designed by Jean Nouvel for the Louvre Abu Dhabi is based on the building's domed roof. The furniture, which was created in partnership with Poltrona Frau, was unveiled during Milan design week, in time for the museum's planned opening later this year. The range includes armchairs, stools and double-sided sofa benches, all made from curved forms intended to reference the rounded profile of the museum building – designed by Ateliers Jean Nouvel. "Architecture does not stop at the front door," said Nouvel. "The separation between architecture and interior design is artificial: any detail has the potential to disrupt the sense of harmony and destroy meaning." 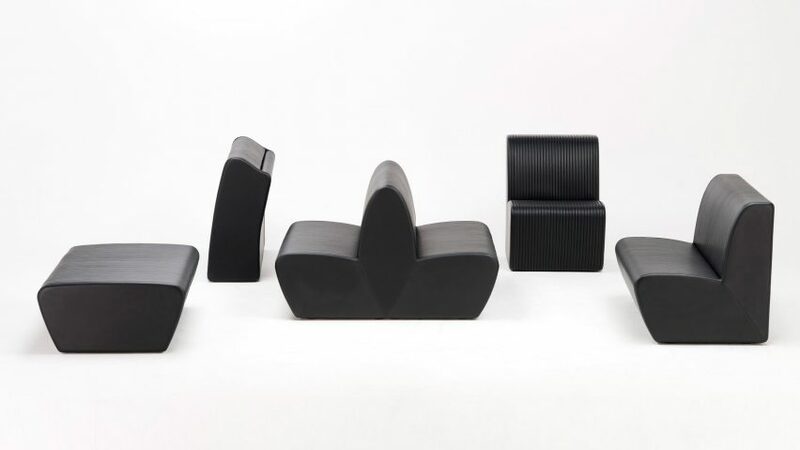 Designed to have "comfortable yet bare ergonomics", the furniture features black leather upholstery with a ribbed pattern that runs across the seats. The seating's frame is made from large pieces of moulded foam, to create a single shape with "tensed curves". "These long and massive shapes positioned precisely along the walls and slightly staggered emphasise the building's scale and lines of composition," said the French architect. The Abu Dhabi Louvre building is part of a new cultural district on the city's Saadiyat Island, that will also host a new outpost of the Guggenheim, designed by Frank Gehry, and the Foster + Partners-designed Zayed National Museum. Nouvel set up his firm, Ateliers Jean Nouvel, in 1994, and has worked on projects around the world including the Philharmonie de Paris concert hall in France, and the National Art Museum of China in Beijing. He was awarded the Pritzker Prize in 2008. The architect placed 40th in Dezeen Hot List, taking 22nd place in the architects ranking.